"Sen. Ted Cruz, R-Texas, has called on the Trump administration to act on two laws that demand automatic defunding of U.N.-affiliated agencies that have allowed the Palestinians to join as a state. The two laws, passed by Congress in the early 1990s, were meant to deter the U.N. and specialized agencies from accepting the Palestinians as a full member and not to allow groups that aren't recognized as a state to join. Cruz pointed to the most recent example of a U.N. agency allowing them to join: 'The law requires the Trump administration to restrict funding from agencies like the Universal Postal Union, and the administration should clearly convey to the Postal Union that it intends to enforce the law.'..." "A CNN commentator lambasted Israel in a U.N. speech that drew applause from world leaders on Wednesday, while calling for a 'free Palestine from the river to the sea' -- language critics describe as a dog whistle advocating the elimination of Israel. 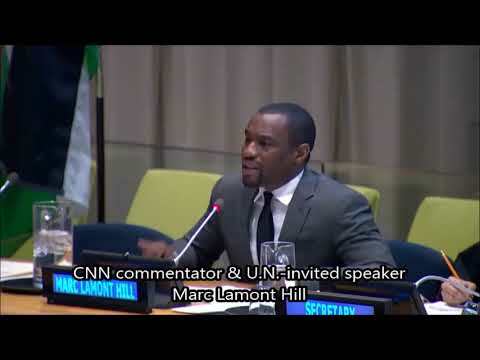 Marc Lamont Hill made the remarks during a special meeting of the Committee on the Exercise of the Inalienable Rights of the Palestinian People in observance of the International Day of Solidarity with the Palestinian People. 'Hill's call at the United Nations for the destruction of the Jewish state was not some accident. He didn't misspeak. He was an invited guest. He was the only person invited to speak as 'the' representative of 'civil society.' When he ended his extraordinary tirade with 'Give us a free Palestine from the river to the sea' his words were met by a round of applause. The only applause for any speaker,' she said." "The recent decision by Airbnb to stop its services for Jews living in the West Bank of Israel is being met with criticism by the Trump administration and pro-Israel leaders on Capitol Hill, according to sources who spoke to the Washington Free Beacon about the company's choice to join the anti-Israel Boycott, Divestment, and Sanctions movement, or BDS, which aims to wage economic warfare on the Jewish state. Airbnb, a growing tech company that allows travelers to rent lodging across the globe, announced that it removed some 200 Jewish-owned rental homes in the West Bank, sparking fury in pro-Israel circles. The deepening controversy over Airbnb's decision to join the BDS movement is beginning to be discussed within the Trump administration and its allies on Capitol Hill, who could potentially penalize company. Already, there is discussion that Airbnb's move could trigger state and federal laws barring discrimination based on religion and ethnicity. A State Department official, speaking to the Free Beacon about the matter, categorically rejected Airbnb's boycott. 'The administration's strong opposition to boycotts, divestitures, and sanctions is well-known,' the official said. On Capitol Hill, Trump administration allies are turning their attention to Airbnb. The move to delist Jewish homes could provide the momentum necessary for Congress to finally pass anti-boycott legislation that has long been stalled. 'This kind of persecution has no place in any society and must end,' Cruz said. 'Airbnb should reverse its decision, and I will continue to work with my colleagues to combat anti-Semitism here and abroad.'..." "Seventy years after the exodus and expulsion of some 850,000 Jews from Arab states and Iran, the heads of communities of Jews from Arab countries are demanding the United Nations officially recognize the suffering they were forced to endure. In a letter to U.N. Secretary General Antonio Guterres, community leaders, among them Dr. Shimon Ohayon, director of Bar-Ilan University's Dahan Center and chairman of the Alliance of Moroccan Immigrants wrote, 'While the U.N. organizes events to mark the departure of 450,000 Palestinians from Israel upon the establishment of the state, following a war imposed on Israel, we do not see recognition of the expulsion of Jews from Arab countries...We therefore seek to establish a memorial day for the Jews' expulsion from Arab lands.'..."